Johnson is the clear number one fantasy wide receiver in the NFL. He has the most talent and production out of anyone at the wide receiver position to put up high fantasy numbers. Last year he had almost 1500 yards and 12 touchdown, and he wasn’t even fully healthy. 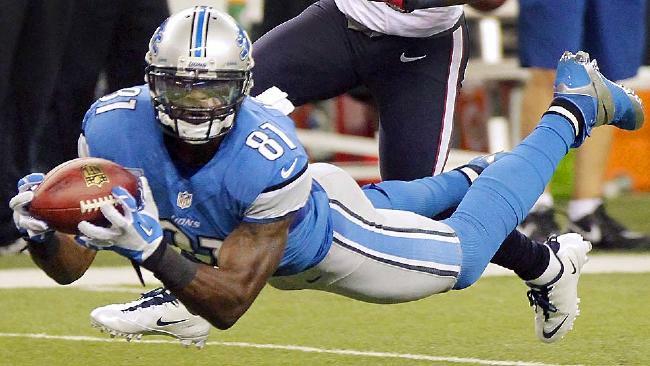 Expect big numbers from Megatron this year and don’t be afraid to use a late first round pick on him. You could go either way between A.J. Green and Demaryius Thomas. Green is my second rated wide receiver because he is the most targeted wide receiver in the NFL. He is a constant target for Dalton and a very good deep threat. He will have a few down week due to the inconsistency of Dalton, but expect another monster year for Green. Thomas had a huge breakout year with Manning’s record breaking year. He finished second in the NFL in receiver fantasy points with over 1400 yards and 14 touchdowns. The question will be how much of a drop off Manning will have from his record breaking year. I don’t believe he will have the same production he did last year as he has two talented receivers around him in Emmanuel Sanders and Wes Welker along with decreased numbers from Manning. He will however finish in the top five in fantasy points out of receivers and have another great year with Peyton as his quarterback. Julio Jones was off to a monstrous start to the 2013 season before he got hurt and had to miss the final 11 games. Jones was on pace to be the top fantasy wide receiver last year and would have helped a sluggish Atlanta offense. Julio Jones does have injury concerns as he has struggled to stay on the field all 16 games. Expect a bounce back year for Julio though and be one of the top wide receivers in fantasy. Bryant had a great year finishing 7th in fantasy points, and second in touchdowns with 13. He remains Romo’s favorite target, especially in the red zone. Bryant sometimes disappears in the Dallas offense with seven games of single digit fantasy production. Bryant will have to become a little more consistent in the Dallas offense to become an elite wide receiver. However, his talent is there to have another great fantasy year with Romo and the Dallas offense. Marshall has been a tremendous wide receiver for the Chicago Bears the past two years. He has finished as a top five wide receiver in that time and a combined 25 touchdowns. He is a great red zone target and should continue being a very productive wide receiver. A possible negative could be Alshon Jeffery taking away some of his production, but I think the difference will be minor and both will flourish. Under Marc Trestman’s offense expect another great year for Brandon Marshall. Jordy has been Aaron Rodgers top wide receiver for the past few seasons and has been extremely productive. What hurt his production last year was the absence of Aaron Rodgers for half of the season. Although with the numbers Jordy put up when Rodgers played the entire game, he was projected for the season to finish as a top three wide receiver. That is elite production over names like Calvin Johnson, A.J. Green and Dez Bryant. Jordy Nelson is a solid wide receiver who should see a spike in production with Green Bay going to the hurry up offense and Aaron Rodgers being back. You can take Jordy Nelson and know you are getting a legitimate number one wide receiver. Brown enjoyed an incredible breakout year with 110 catches and almost 1500 yards, almost doubling his production from the year before. He continues this year as the number one wide receiver for Ben Roethlisberger as he will try to replicate last year’s production. Emmanuel Sanders is also gone this year so look for his targets to possibly even increase. Brown is definitely a number one receiver this year despite not having the big name. had a breakout year finishing in the top ten in fantasy points for wide receivers. He has fit well in Marc Trestman’s offense stretching the field as a deep threat and shows a great ability to go up for jump balls. He will also explode for a great game every once in a while as he had over 200 yards twice last year. Still, Jeffery is not the top wide receiver on his, team so that hurts him a little in production. However, expect another good year from Alshon Jeffery and you can trust him as a good number one wide receiver. Last year was supposed to be Cobb’s breakout year, however that ended quickly after his injury five games into the season. He had a few productive games going over 100 yards and a touchdown against the 49ers and the Redskins. In a contract year, look for this to be Cobb’s breakout year. He should get a lot of receptions running out of the slot and with Green Bay’s new hurry up offense. The downside is he could fail to produce up to number one wide receiver standards that we’ve come to expect from him. Take him as a fringe number one wide receiver as a guy with elite upside. The wide receiver position starts to dip a little bit right here with Vincent Jackson. Jackson has all the tools of a number one fantasy receiver, but his situation and consistency makes him a fringe number one wide receiver. He was incredibly inconsistent last year having three over 20 point games, but also having five games scoring 3 points or less. A lot of that has to do with the quarterback. Picking Vincent Jackson comes with a lot of risk, but the upside is there if there quarterback Josh McCown can be productive and reliable. Johnson is still a very productive wide receiver despite not having a reliable quarterback and entering his 12th season in the NFL. Andre Johnson remains a very good wide receiver and the clear number one for the Texans. However, he put up a lot of inconsistent weeks due to lackluster quarterback play. Now the Texans have Ryan Fitzpatrick at quarterback, but it is still up in the air how productive they can be together. That will be the risk when taking Johnson and whether he can be consistent week in and week out. Keenan Allen had a very good rookie year becoming one of Phillip Rivers’s favorite targets. Look for Allen to take another step towards being a top ten wide receiver in his second year. He must become a bigger part of the offense though if he wants to become a number one wide receiver. Out of the top twenty fantasy wide receivers last year, Keenan Allen had the least amount of targets. Hopefully Keenan Allen can build off of last year’s rookie season and become a reliable fantasy wide receiver. Only one player last year had at least five catches ever single game last year. No it wasn’t A.J. Green, Demaryius Thomas or Megatron… it was Pierre Garcon. Garcon is highly underrated in fantasy football as a consistant weekly option. He won’t put any 2-3 point dud weeks as he his always in the game plan. He isn’t a deep threat, but he can be very successful with the number of receptions he gets. Look for the addition of Desean Jackson to help Pierre Garcon get open and more receiving yards. He should be looked at as a top 15 wide receiver and a top 10 wide receiver in PPR leagues. Desean Jackson is a very good deep threat at the wide receiver position for the Redskins. This is a weapon that Robert Griffin III has not had during his NFL career. If RGIII can get back to his rookie form, look for Desean Jackson to have a great year. The risk with Desean Jackson is that he and RGIII do not have the deep threat chemistry and he struggles. It is a major risk/reward with Desean Jackson because he did finish as a top ten wide receiver last year. However, RGIII reliability is still in question which would make Desean Jackson inconsistent if the quarterback struggles.